For as long as I’ve known of their existence I have longed to see them. Forever after I assumed that meant going to China and, given our travel plans, China always seemed forever away. It never really occurred to me that they might actually come here. You see, they don’t get around much and I can’t really blame them, being clay and all. 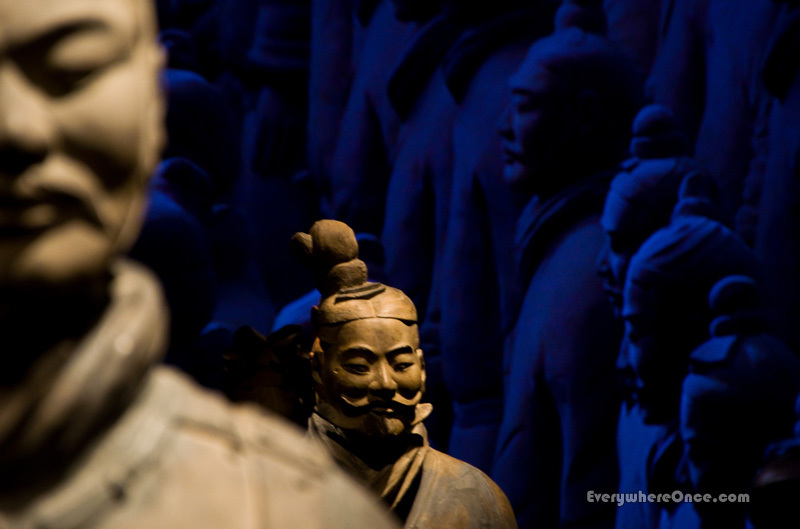 It was a rendezvous roughly 2,259 years in the making, but here in San Francisco, of all places, I finally got to visit briefly with China’s Terracotta Army. Built to protect the First Emperor in the afterlife, this life-sized army of over 8,000 soldiers, horses and chariots is the largest of its kind ever constructed. Or so we think. 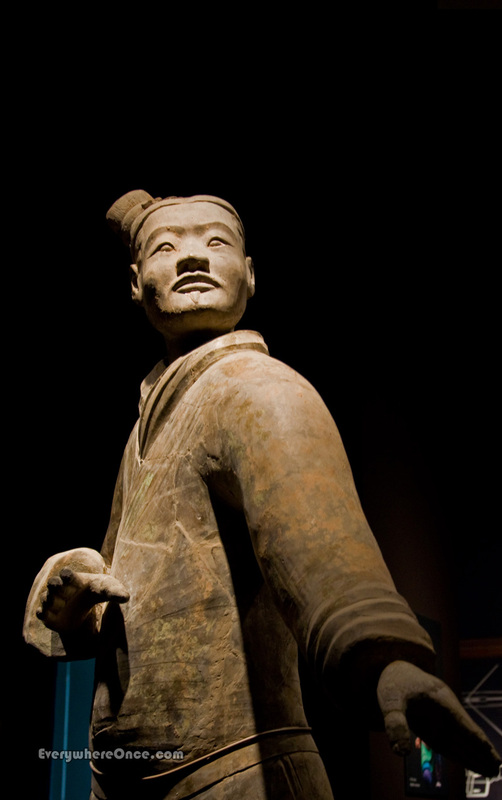 After all, Qin Shi Huang’s army remained buried for thousands of years before it was discovered by chance in 1974. Who’s to say others don’t exist as yet undiscovered elsewhere? Even so, other armies would need more than just large numbers of men and horses to claim bragging rights. They’d also need to match this one’s stunning variety where each warrior is outfitted with his own unique armor, weapons and posture. They even have different heights, hair styles and facial expressions. They’d also need to top the elaborate necropolis uncovered at Qin Shi Huang’s burial site, which includes offices, reception halls, stables, sacrificial pits, an armory, an entertainment arena and an imperial zoo; all intended to reconstruct the late emperor’s Imperial Palace for him in the afterlife. Sadly, not all of that could make the trip. 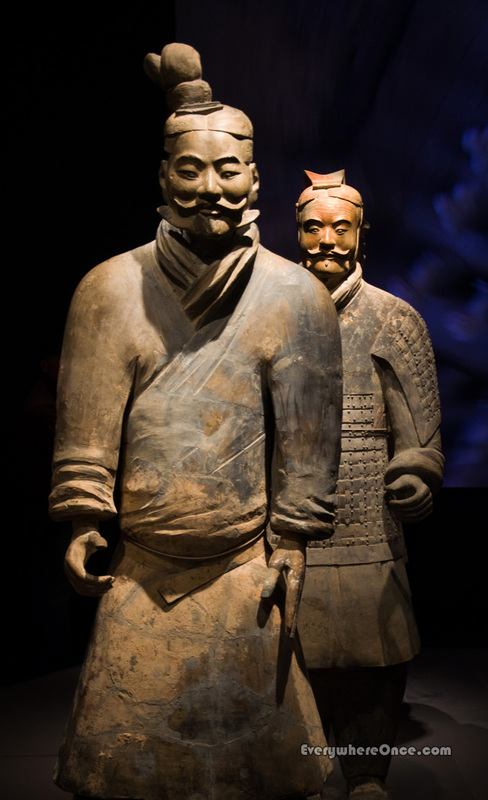 Only about twenty figures made their way to San Francisco’s Asian Art Museum. To see the rest, or at least the two thousand figures they’ve unearthed so far, we’ll have to finally make a pilgrimage to where they live, in Xian, China. These are something I always wished I could see as well. Very nice job with the photos! definitely on the bucket list. They are just so awe inspiring. Yeah, this little taste definitely just whetted the appetite. Never knew they got around so much. Very cool. Impressive even in small numbers or is it that your photos more than do them justice? Reblogged this on K A C Johnson Books. Very impressive, great photos! We saw a similar size exhibition in Hong Kong – it was awesome! We definitely plan to go. Can’t wait. Happy to have seen these guys when they were in Discovery Times Square, New York City! They do get around, huh? You’re lucky to have seen them. And gorgeous photos, as always. wonder if they’ll ever visit Sicily, globetrotters as they are? Send them an invite. Who knows? I think I’m right in saying that only a portion of the site has been excavated so far. I was also listening to a radio programme once about the conservation efforts and apparently they would once all have been painted in glorious technicolor! It’s true. Once the air hits them the paint deteriorates rapidly. I do think that some are being left under ground to protect them. I wonder, though, if they’ll restore them to their original brilliance the way they restore old paintings. Thanks for stopping by and for the great tips. We viewed them at the National Geographic headquarter’s museum in Washington, D.C. a year or so ago. Nice to learn they are in SF now. Wow! I can’t begin to imagine all the time and work that went into an army of 8000. They must have thought the afterlife was a dangerous place. 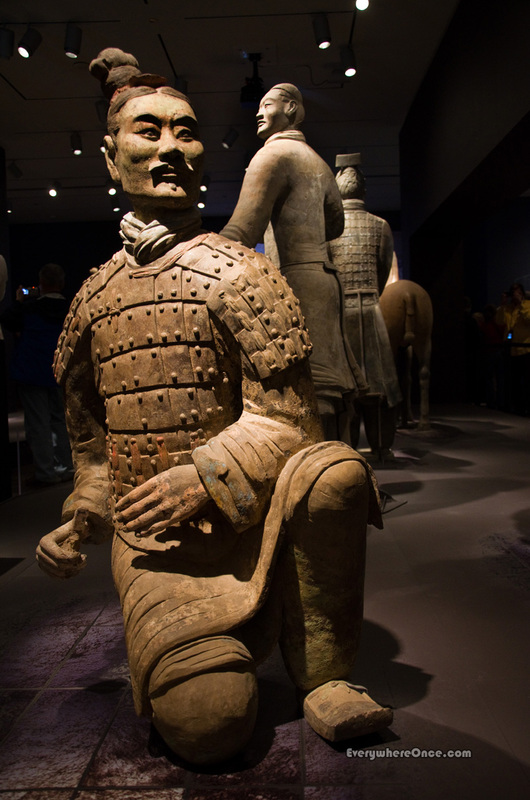 I saw the terra cotta army when it travelled here to Toronto. THanks for reminding me how amazing the statues are. I was fortunate enough to see them in Xian in 2009. I took a tour with a local guide, who showed us a nearby “mound” that is believed to be the site of his underground “palace,” which reportedly had rivers of mercury. They say the mercury level in this area is higher than normal levels, so some spectators believe this to be the site. I hope I live long enough to see the palace excavated, as I believe if there was an army of this magnitude, they must have been guarding something magnificent.